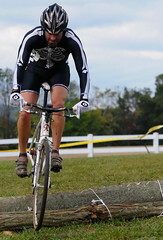 Kelley Acres ‘Cross took place October 4 in Middletown, Maryland. The day featured several compelling races. We are going to highlight two right now and follow up tomorrow with more from the BCA race and Kelley Acres. The Men’s Masters 3/4 field is a strong lot. It is a sweet spot for many competitors that may not be racing as much because of family, work and other life commitments. The beauty of cyclocross is that the races are not so long that racking up hours and hours of base mile training is essential, the venues are family-friendly and the season is condensed to about three months. This is not to say it is easy, just that it is possible to be successful with short, intense training. Seibold riding the log barriers. Photo: Demoncats Photography. The Kelley Acres venue, at first glance, is not one that would favor a single-speed set-up. The course has one long climb, a fast descent into a long flat drag, and a host of elevation changes. This did not seem to concern Jonathan Seibold (Family Bike Shop), who rode his single-speed to victory in the masters 3/4 field. Jonathan ran away from the field in this race. Literally. He punched it coming in to the flyover, sprinted up the steps, and established a gap on the first lap that was never closed. 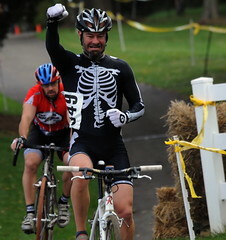 The Mens 3/4 race featured racers at the other end of the life-commitment spectrum. The first two finishers’ race ages combined, equal 36. 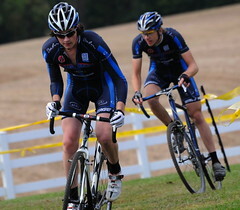 Race winner Sam O’Keefe, racing age 16, continued his dominance of the MABRA 3/4 field. For this race, Sam teamed-up with fellow C3-Athletes Serving Athletes rider Tom Mackay, race age 20, to put a pretty good hurting on the field. We caught up with Sam and Jonathan to ask them about their day. Did you race BCA ‘Cross on Saturday? If so, did you choose any different gear or change your warm-up for Kelley Acres? Any easy spinning or other riding post-race on Saturday? Jonathan Seibold (1st Mens Masters 3/4, Family Bike Shop): I rode the same setup both days. On Sunday I brought my family with me so I got to the venue a little later than usual and only got one lap on the course. Then I just rode around on the property before our race. Sam O’Keefe (1st Mens 3/4, C3-Athletes Serving Athletes): I had to work on Saturday, unfortunately, so I just tried to get to sleep as early as possible. What was your favorite part of the course? What feature could you have done without? O’Keefe: I felt like I could make up the most time on the long climb on the backside, also the part when you went under the fly-over was super cool. As a whole it was a very fun and challenging course. Seibold: The flyover was sweet. Didn’t really like the creek crossing over the boards and tree limbs. I was afraid of a pinch flat every lap. How did you approach the fast descent into the sweeping left-hander on the backside of the course? It was fast and slippery in the morning and then seemed to dry out some. Share your technique. Seibold:I tried to flow through there with as little braking as possible. I unclipped my foot every time. I pretty much just let it go and trusted my tires. O'Keefe and Mackay pushing the pace. Photo: Demoncats Photography. O’Keefe: I braked from the middle of the hill into it and then let it go about halfway through the turn, it got washboarded and fast as the day went on but mainly I was trying to stay upright because I figured that would be better in the long run. the first lap was especially sketchy. Any thoughts on the flyover? Good, bad, not a factor? O’Keefe: flyovers are always fun, it didn’t change much though. Seibold: I loved the flyover. I think that it was a huge factor in our race. Did you ride or dismount for the log barriers? If you rode or hopped the logs, walk us through your technique. Seibold: I rode the logs. I just treated it like a log over in mountain biking. Front wheel down shift my weight back as I bring the bike forward. O’Keefe: I ran both of them because I didn’t want to break my bike. Mountain biking it would be fine but it seemed just as fast to treat them like barriers. Seibold takes the win. Photo: Demoncats Photography. Tell us about the decisive moment in your race. O’Keefe: Me and my team-mate, Tom [Mackay], were taking turns at the front from the start. After a couple laps I took a big pull going up the steep hill and didn’t look back until later, when I did he had dropped off a little, I was unsure where everyone else was so I kept driving. I think in the end he was about 30 seconds or less behind me. Seibold: On the first lap at the flyover I rode over the logs and attacked the steps as fast as I could. By the time I was off the ramp I had a gap and was able to stay away. What did you eat post-race? Seibold: Went to Brewer’s Alley in Frederick and had a pulled pork sandwich and a beer. O’Keefe: I drank a lot of water, ate some good food from the venue, and had a full meal when I got home. O’Keefe: To all the sponsors of the C3-Athletes Serving Athletes team, and Kris Auer, my coach. Seibold: Thanks to Joe Jefferson for yelling for me the whole race and all of the people cheering for me around the course. Really kept me going. And to my wife for coming out with the kids. Glad she got to see me win my first race. Nice write up and pics. Congrats to JS for getting it done on an SS!